Italy has a number of catacombs housing the bones of the dead, but did you know that Italy also has mummies? Central Italy and Sicily have mummy exhibits that are open to the public by guided visit, often in churches. These mummies have been naturally preserved and the displays can be a macabre sight, so we generally don't recommend them for young children. While most Christian catacombs, especially the most famous ones in Rome, have long had their bones removed from public view, there are still several well- and lesser-known places to see mind-boggling displays and countless numbers of skulls and bones. Note: In virtually every case, these cemeteries, catacombs, chapels, and chambers are places of worship. Though they may appeal to visitors' sense of the macabre, it's still necessary to be respectful when viewing them. Photographs are generally prohibited, so as a matter of respect, don't try to sneak a selfie with a skeleton. 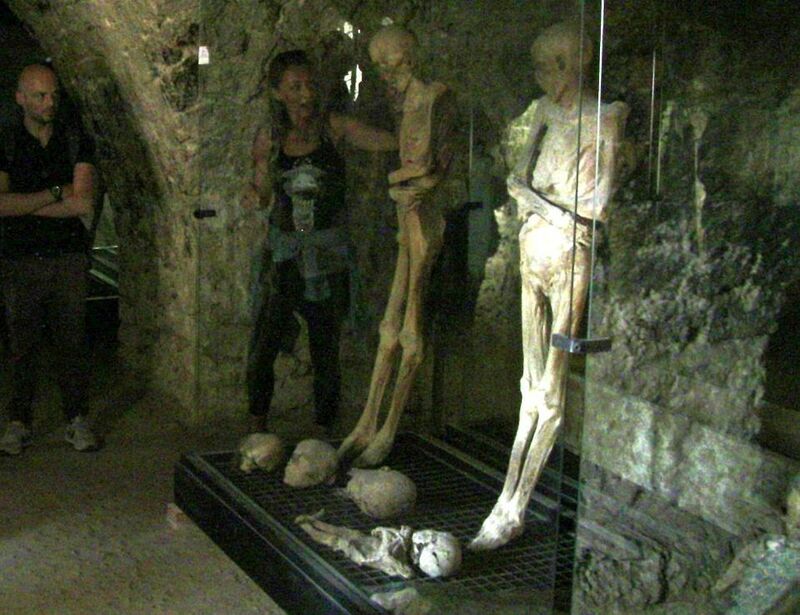 The Ferentillo Mummies Museum: The tiny town of Ferentillo in southern Umbria holds an interesting surprise below the Church of Santo Stefano. Bodies buried there were preserved by a rare microfungus that attacked the corpses and turned them into mummies. Some of the best-preserved mummies are on display in what is now the mummy museum in the bottom part of the church. Catacombs of the Capuchins: In Palermo, Sicily, the Catacombe dei Cappuccini contain mummified bodies, many in good shape that still look lifelike. These bodies were mummified by a preservative found in the catacombs. Get visiting information and details in Catacombs in Sicily. Skeletons and Catacombs in Italy: Skeletons are found in catacombs in several places in Italy. Mazes of underground tunnels were used to bury thousands of bodies and some of them are open for tours or visits. Rome has some of the best catacombs, though in most cases, the catacomb custodians have removed the bones of the deceased from public view. Still, it's fascinating to see these underground cemeteries and learn about their context as early places of Christian worship. Read more in our guide to the Catacombs of Rome. Note that in all Rome catacombs, visits are by guided tour – with miles of tunnels descending for several levels underground, you don't want to risk getting lost without a guide! The Capuchin Crypt and Museum: In Rome, the best-known skeletons hang around – quite literally – at the Museum & Crypt of the Capuchin Friars, on Via Veneto. Here, thousands of Capuchin brothers are interred in an above-ground cemetery, their bones and skulls arranged as wall decor and even as chandeliers. It's an odd place to experience, but also surprisingly reflective and moving. Spooky Places in Rome: Rome has several places where you can see scary attractions, including the body parts of saints and other unusual relics in Rome's churches. Etruscan Tombs in Italy: If you prefer to see the tombs without the bodies, there are many surviving Etruscan tombs (pre-Roman) in central Italy. One of the best places to see painted Etruscan tombs is in the Northern Lazio town of Tarquinia, where there's also a good archaeological museum.